1. Signs of Acetaminophen Poisoning. Acetaminophen is a pain reliever that is used to treat mild to moderate pain from headaches, muscle aches, menstrual periods, colds and sore throats, toothaches or backaches. It can also be used to reduce fever. Side effects of acetaminophen include red, peeling or blistering skin; rash; hives; itching; swelling of the face, throat, tongue, lips, eyes, hands, feet, ankles, or lower legs; hoarseness; and difficulty breathing or swallowing. Too much acetaminophen may cause liver damage, which may even lead to death. 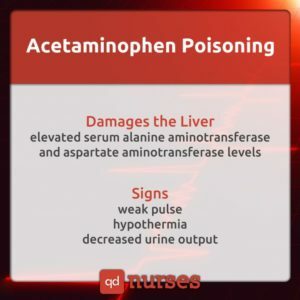 Acetaminophen poisoning signs include weak pulse, hypothermia and decreased urine output. 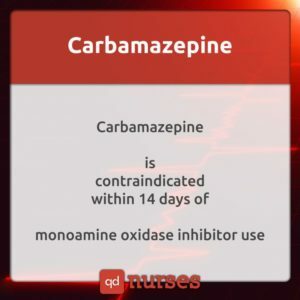 Carbamazepine is an anticonvulsant that works by decreasing nerve impulses that cause seizures and pain. It is used to treat seizures, nerve pain and even bipolar disorder. 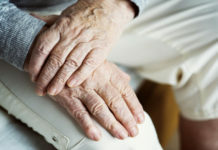 Carbamazepine should not be taken if there is a history of bone marrow suppression, if taking nefazodone or if allergic to antidepressants such as amitriptyline, desipramine, imipramine, or nortriptyline. 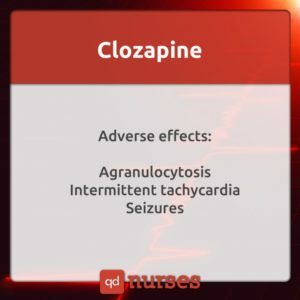 Clozapine is an antipsychotic drug used to treat schizophrenia or to reduce the risk of suicidal behavior in people with schizophrenia or similar disorders. It works by changing the actions of chemicals in the brain. It may cause severe dizziness, slow heartbeats, fainting, or seizures. Disulfiram is a drug used to support the treatment of alcoholism by producing an acute sensitivity to alcohol. It inhibits acetaldehyde dehydrogenase, which causes an unpleasant reaction when alcohol is consumed. 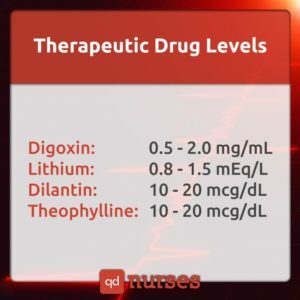 Even only small amounts of disulfiram in the body can cause flushing, sweating, nausea or severe vomiting, increased thirst, swelling, neck pain, blurred vision, throbbing headache, chest pain or shortness of breath, pounding heartbeat, weakness, confusion, or dizziness. 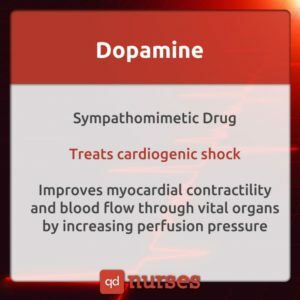 Dopamine is an adrenergic and dopaminergic cardiac stimulant that is usually prescribed for heart failure. Side effects include abnormal heart rhythm, fast heart rate, chest pain, palpitations, slow heart rate, high blood pressure, narrowing of the blood vessels, difficulty in breathing, nausea, vomiting, elevated BUN (blood urea nitrogen), headache, anxiety, piloerection (erection of the hair of the skin), and gangrene of the extremities. Sucralfate (Carafate) is used to treat and prevent ulcers in the intestines. It is also used to treat inflammation of esophagus from backflow of stomach acid. Constipation, dry mouth, stomach upset, gas, and nausea may occur. It is best to take Carafate before meals. Cimetidine (Tagamet) is used to treat ulcers of the stomach and intestines and prevent them from coming back. It is also used to treat stomach and throat conditions caused by acid reflux. It is usually prescribed for the treatment of duodenal ulcers, active gastric ulcers, gastroesophageal reflux disease (GERD), pathological hypersecretory conditions, and the prevention of gastrointestinal bleeding. It is best to take Tagamet with food. Antacids are agents that neutralize the gastric acid and raise the gastric pH. They are used to treat dyspepsia or as symptomatic relief for peptic ulcer. 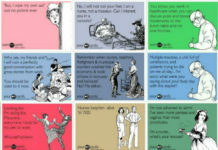 It can cause nausea, constipation, diarrhea, or headache. Antacids are best taken after meals. 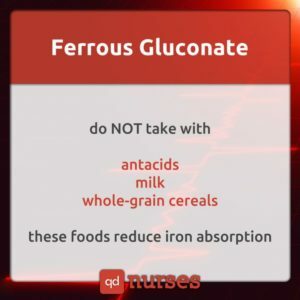 Ferrous Gluconate is a type of iron that is used to treat iron deficiency anemia. It should not be taken if the patient has iron overload syndrome, hemolytic anemia, porphyria, thalassemia, liver or kidney disease, if patient is an alcoholic, or if receiving regular blood transfusions. A hormone produced by the pancreas, glucaon controls the level of glucose in the blood, along with insulin. It is usually given to patients who are hypoglycemic and unconscious. Early symptoms of low blood sugar include sweating, drowsiness, dizziness, sleep disturbances, palpitation, anxiety, tremor, blurred vision, hunger, slurred speech, restlessness, depressed mood, tingling (in the hands, feet, lips, or tongue), irritability, lightheadedness, abnormal behavior, inability to concentrate, unsteady movement, headache, and personality changes. Symptoms may be different for each person and can happen suddenly. 10. 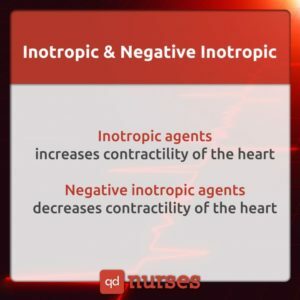 Inotropic and Negative Inotropic Agents. An inotropic medication is a drug that alters the force or strength of the heart’s muscle contractions. There are two types of inotropic medications: the positive and the negative. Positive inotropic drugs make heart beat more strongly, while negative inotropic drugs make the heart beat less strongly. Both are used in managing conditions that affect the heart. Iron elixir is used to supplement iron in the diet, thus preventing or treating low levels of iron in the blood. It is better absorbed on an empty stomach, and should be taken with a full glass of water or juice. Loops diuretics work by helping the body get rid of sodium and water. They make the kidneys put more sodium into the urine, and the sodium takes water with it from the blood. This decreases the amount of fluid flowing through the blood vessels, reducing pressure on the walls of the arteries. 13. Monoamine Oxidase Inhibitors (MAOIs). 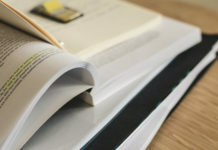 Monoamine Oxidase Inhibitors (MAOIs) are antidepressants that are used to balance certain neurotransmitters by reducing the amount of monoamine oxidase. Emergency side effects include troubled breathing, swelling of the face, hives, chest pains, altered heart rate, severe headache, stiff neck, and nausea or vomiting. 14. 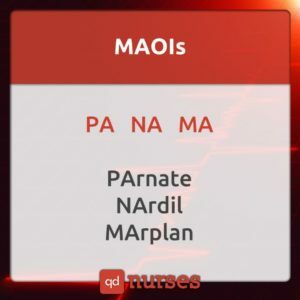 Potassium and IV Push. 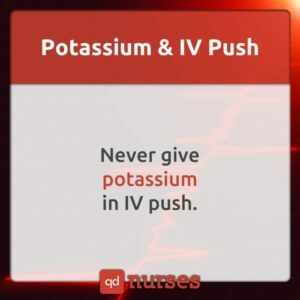 Potassium must never be administered via IV push or bolus, because it will result in the patient receiving too much potassium too quickly. Instead, it should be diluted and infused over a certain period of time. 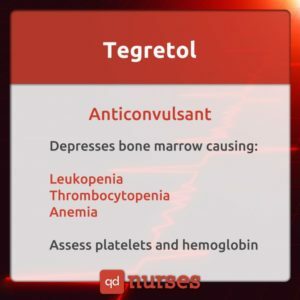 Tegretol is an anticonvulsant or antiepileptic drug which is used to control and prevent seizures. It works by reducing the spread of seizure activity in the brain and restoring the normal balance of nerve activity. It may also be used to treat certain mental and mood conditions (such as bipolar disorder) and other types of nerve pain. 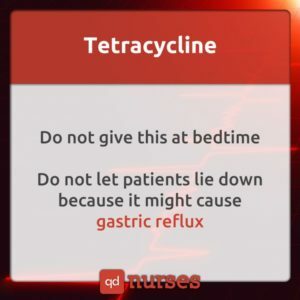 Tetracycline is an antibiotic used to treat a wide variety of infections. It works best when taken on an empty stomach an hour before or two hours after meals. Side effects include nausea, vomiting, diarrhea, loss of appetite, mouth sores, black hairy tongue, sore throat, dizziness, and headache. 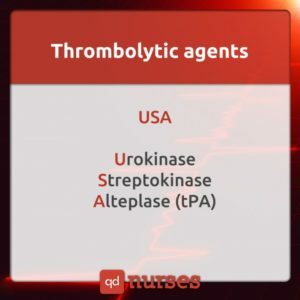 Thrombolytic agents are used to dissolve blood clots which are usually the cause of both heart attack and stroke. 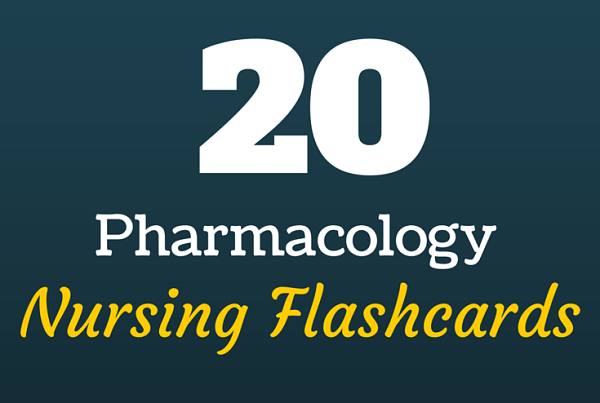 One rare but serious complication of thrombolytic therapy is hemorrhagic stroke. 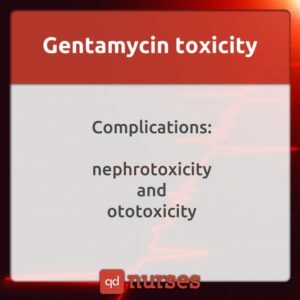 Toxicity is a serious, often harmful, sometimes fatal, toxic reaction to an accidental overdose of a drug. Preferring one drug to another when both drugs are equally effective lowers the risk of overdose toxicity.